As a part of the thanksgiving recipe series, earlier I posted cranberry sauce. 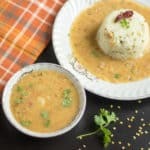 Before getting into how I used the cranberry sauce in other recipes, let me share some savory recipes. 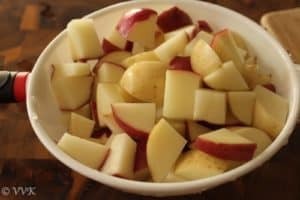 I cannot skip potatoes, when it comes to thanksgiving. 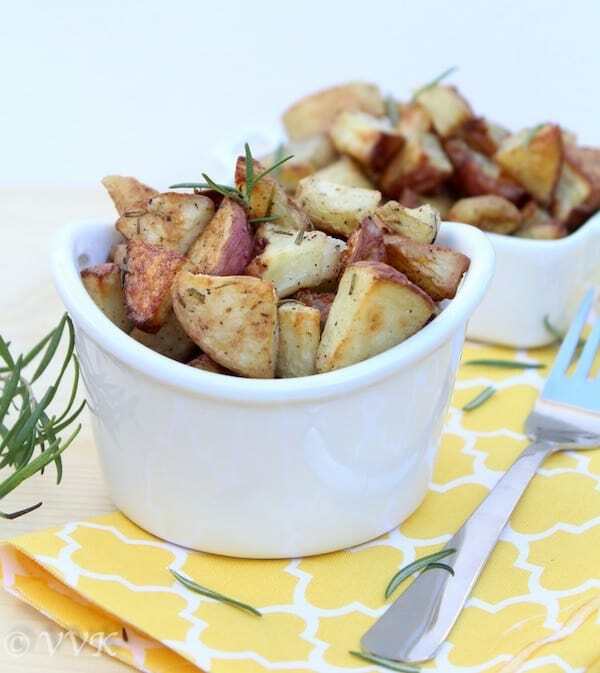 So here is the popular thanksgiving side, oven roasted rosemary potatoes. Thanksgiving feast is all about seasonal fruits and veggies with fresh herbs. 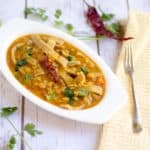 Herbs play a major role in the thanksgiving meal. 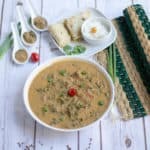 They not only decorate and fill your dinner table with aromas but they enhance and elevate the flavors and tickle your taste buds. 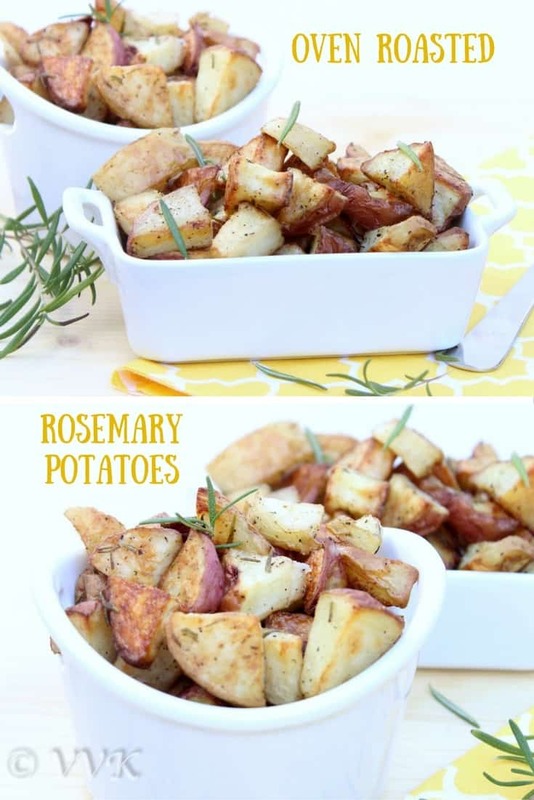 I used oregano for my gravy and now for these gorgeous potatoes, I am using rosemary. Rosemary is an aromatic evergreen shrub with needle like leaves, which are used, for flavoring the foods. The other highlight is, this shrub can withstand draught and also it has pest control properties, which makes it a perfect backyard herb. 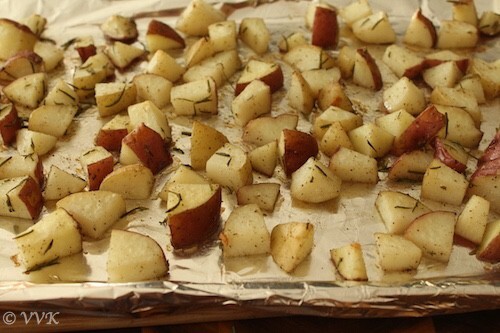 With out any further delay, here comes my oven roasted rosemary potatoes. 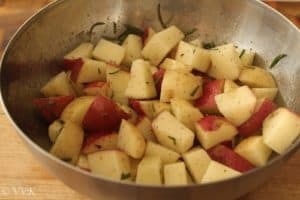 Wash the potatoes and chop them into small cubes. Wash the rosemary and chop them into small pieces. 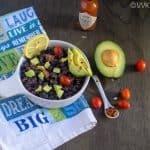 Pat them dry and add it to a wide bowl. 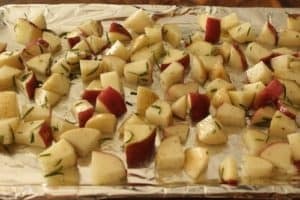 Also cover your baking tray with parchment paper or aluminum foil and grease them with oil or if using a casserole pan grease it with olive oil. Cover the baking tray with parchment paper or aluminum foil or with silicone mat. Make sure you parchment papers holds the 400 degree temperature. It varies with brand. The one that I use, holds upto 420 degree F, but I always prefer aluminum foil or silicone mat. If your parchment paper doesn’t hold 400 degree F, bake these at a lower temperature for a longer period. 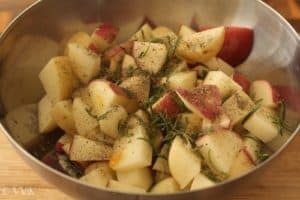 Add the garlic infused oil oil, chopped rosemary, salt and pepper to the potatoes and toss them well. 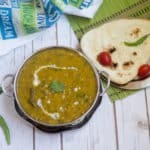 Ensure the oil and spices are coated evenly. Now spread this to the baking tray and bake them for 40 minutes tossing them once in between at around 20 minutes. That’s it. 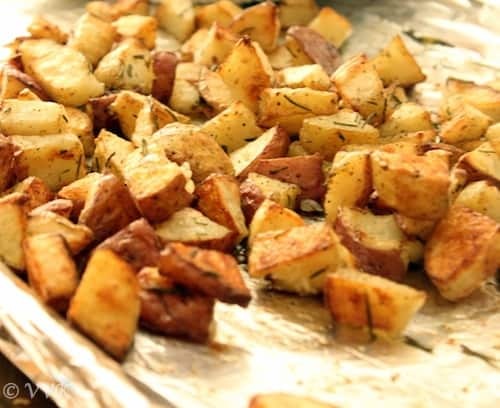 Yummy roasted rosemary potatoes are ready. I used a combo of red and yellow potatoes. But either one can be used or even purple potatoes or baby potatoes. Instead of regular salt, flavored salt or kosher salt can be used. If you don’t have, garlic infused olive oil, you can use regular olive oil and grate about 2 cloves of garlic. I love the combo of garlic and rosemary. But garlic can be skipped too. 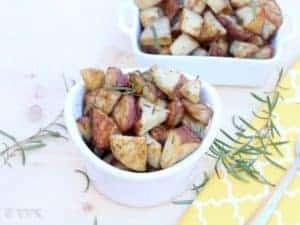 A popular thanksgiving side - Oven roasted rosemary potatoes - Potatoes roasted with rosemary and garlic infused olive oil. Nice one Vidhya!! 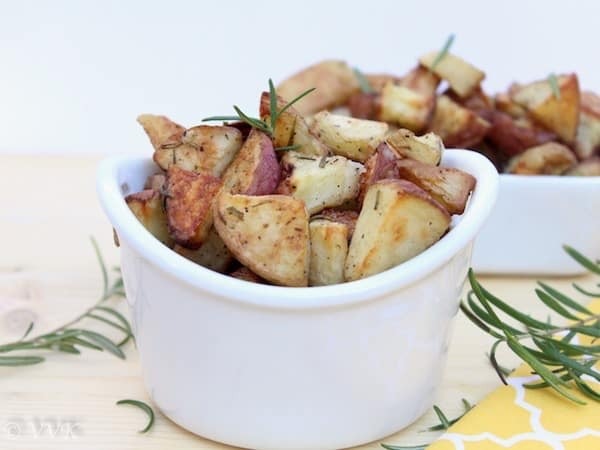 Love the combo of potato and rosemary..
Lovely Vidhya.. :) I loved the color of red potatoes and fresh rosemary.. sigh! Wish I could get it easily..
Lovely Share!!! I love baked Potatoes. :-) Me too. 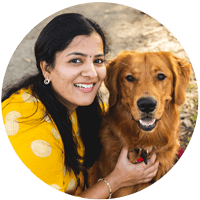 Thanks Preethi.